Brembo RCS radial brake master cylinders allow the rider to choose between power or precision in relation to road conditions, the weather, personal preference for feel and familiarity with the bike. This patented master cylinder, derived directly from the unit used in MotoGP, features an innovative adjustment system that allows the same master cylinder to cater for the many different requirements of even the most exacting customer. Created specifically to bring MotoGP and Superbike technology to countless enthusiasts, the Brembo RCS radial master cylinder sets new standards for high performance brake components in terms of technology and style. The RCS system consists of an adjuster that sets the brake lever pivot distance to either 18 or 20 mm, for the perfect feedback between rider and machine: setting the pivot distance to 20 mm makes the braking system more reactive and immediate, while a pivot distance of 18 mm makes it more precisely controllable. Changing between the two settings is extremely quick: simply adjust the master cylinder pivot distance by turning the adjuster on the front of the guide lever with cam mechanism by 180° using a screwdriver (red indicates 18 mm, black indicates 20 mm). This changes braking power distribution without modifying the pure power of the system itself. The piston, gaskets and push rod of RCS master cylinders are exactly the same components as those in the master cylinders used by practically all MotoGP and SBK riders, and are manufactured to extremely fine tolerances and ensure very low friction. The lever consists of two main components: the racing lever guide and the folding, forged lever itself. Brembo master cylinders improve response and control in all conditions. The result is an outstanding linearity between the force applied to the lever by the rider and braking response, which translates to unique, unrivalled feel. The master cylinder body is milled using CNC technology from cast aluminium alloy. A hard oxide coating is used for the surface finish. ■Full floating Wave® blades ensure optimum pad-to-rotor contact for maximum stopping force and feel. ■Each of our designs are CAD-CAM and tested with a stress analysis program, as well as dyno / real life tested prior to being offered on the market. Superbike Wave® rotor technology is the pinnacle of rotor design. The ultimate expression of our “Turn12″ philosophy of brake performance, the Superbike rotor demonstrates that while many manufacturers may make brakes that work well in Turn 1 of Lap 1, it’s how those brakes are performing in Turn 12, or in Lap 20, that shows the quality of the product. Time and time again, Galfer riders can be seen out-braking their competition late in races for outstanding results. Just ask Martin Cardenas, who won many races using our brakes on his way to 2010 Daytona Supersport Championship. Galfer’s Standard Wave® rotors are engineered to provide the best performance in the market. Every aspect of our design, from the materials and manufacturing processes to the extensive testing, have been carefully chosen to produce the best quality stainless steel rotor available. 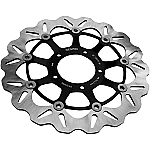 The Standard Wave® rotor provides premium performance both on the street and at the track, and its influence in the industry can be seen in all the designs that try to copy its look. 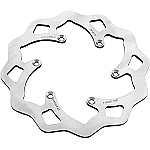 Galfer’s solid-mount Rear Wave® rotors provide all the advantages of the front rotors when coupled with the floating rear calipers found on most motorcycles. Combining the best materials and manufacturing process, these rotors will handle everything you throw at them. Patented inner and outer Wave® design minimizes heat transfer, equalizes dissipation and evens out pad wear. If your looking for the best brake lines available, choose a company that is striving for the highest in quality and performance while putting your safety first... HEL Performance. The only company to offer ALL stainless, including colored banjos. Due to the endless color combinations and endless fitment options - these kits are made to order and are shipped within 48 hours from the manufacturer. TITANIUM KITS - ALL of our brake line kits are available with Ti banjos (ends) and bolts. To choose Ti fittings and bolts for a front line kit only, pick 'Titanium Fittings and Bolts' under the BANJO COLOR pull down. These finely crafted Pazzo Racing levers are direct replacements for aftermarket Brembo brake master cylinders and hydraulic clutches. 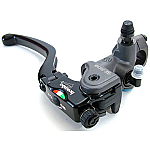 Replace damaged Brembo lever or order a lever to match your Pazzo Racing clutch/brake lever. These universal switches allow rearset users to operate the rear brake light. This all-in-one unit replaces the banjo bolt that connects the rear master cylinder to the rear brake line. You simply replace the bolt with this assembly and splice the wires into your existing brake light switch. The pressure inside your brake system then activates the brake light.